Synaptop lets you give online presentations allowing you to present slides while engaging in rich audio, video, and text communication. 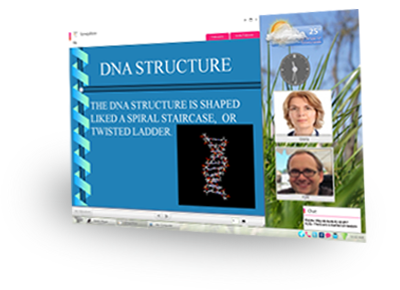 Use for sales pitches, scientific talks, business presentations, and more! Simple and intuitive user-friendly interface. Select from multiple video feeds – webcam or external camera. Supports Powerpoint (ppt,pps,pptx,ppsx,pot,potx), Open Office (odp), Apple Keynote (key), pdf and other formats. See and hear the presenters and their slides. Supports small groups and large audiences. Use whiteboard as an added visual communication tool. Present other files in other apps to your audience! Record and save your presentations. Host unlimited webinars when you want, where you want. Lightweight — Works even on less sophisticated computers. Cross-platform — Works on PCs, MACs, Linux/*nix, Android, Playbook, and other platforms.